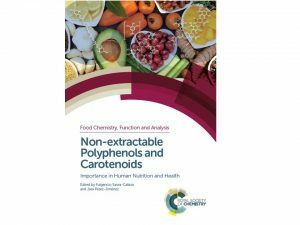 The book “Non-extractable polyphenols and carotenoids: importance in human nutrition and health”, edited by Prof. Fulgencio Saura-Calixto and Dr. Jara Pérez-Jiménez, from ICTAN, has been published by the Royal Society of Chemistry (Reino Unido). It is the first book devoted specifically to non-extractable polyphenols and carotenoids- also known as macromolecular antioxidants. These compounds are dietary antioxidants that, despite their quantitative relevance in foods and their promising biological effects, have been scarcely studied due to analytical reasons. Nevertheless, their contribution to the daily intake of antioxidants make necessary their systematic consideration in studies on dietary antioxidants, as indicated in the present collective work. The book is constituted by 17 chapters, written by a total of 46 researchers from 17 countries and 26 academic or research institutions. These chapters aim to compile all current knowledge on the topic: chemical nature of non-extractable polyphenols/carotenoids; metabolism, with special emphasis on colonic transformations and the microbiota responsible for them; intake assessment in different populations; in vivo effects; effect of food processing; analytical advances; application as food ingredients. Moreover, there are chapters devoted to some specific case-studies, such as tropical fruits, grape products or sorghum. The aim of the book is to transmit current knowledge on macromolecular antioxidants to researchers and professionals not familiar with the field, as well as to provide the basis for develoing further studies on this relevant topic.